Tripp York and Justin Bronson Barringer, eds. THANK YOU! Anyone who enlists pacifism as a badge of honor in some pollyannaish sentiment of good will is an idiot. (Full disclosure: I had to look the proper way to spell pollyannaish.) At the same time, the caricature of Christian “pacifism” as weak-willed, emasculated hippy-religion is equally false. Anyone sincerely interested in investigating the various ways in which Christians conceive, argue for, and practice non-violence would do well to start here. I hope that people read this book (or my representation of it) with an open, generous, but critical eye. 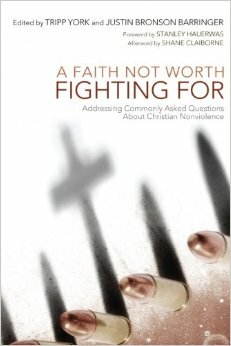 The editors, York and Barringer, want this book to blend academic rigor with accessible language and thought to provide a balanced response to the common, constant questions posed about/against Christian nonviolence. The format of the book is what I thought was brilliant about it before I even read it. Each of the chapter titles (and content) are just basic questions that come up in discussions of Christian nonviolence. What about protecting innocents? There’s a chapter for that. What about honoring those in the military? There’s a chapter for that. What about Hitler? There’s a chapter for that. Didn’t Jesus overturn the tables and hit people with a whip? There’s a chapter for that. What about fighting wild animals? There’s not a chapter on that—there’s got to be a page limit eventually I suppose. One thing worth noting, as Stanley Hauerwas does in his preface, is that all of the perspectives here have been shaped powerfully by the theology of the late Anabaptist theologian John Howard Yoder. In many ways Yoder is the grandfather of Christian nonviolent thought in America. Anyone who is intrigued by these essays (positively or negatively) should go read some Yoder’s The Politics of Jesus and some of his lesser-known essays to get a fuller sense of the meaning, rationale, and practical implications of Christian nonviolence. There are several qualities of the essays in this book worth commending. The biggest thread that seemed to continue throughout all the essays is that Christian nonviolence issues out of a faith that takes serious the claim that Jesus rose from the dead and conquered death. In that sense Christian faith, as it did in powerful ways in the first few centuries of its existence, must take seriously the fact that suffering and death are not horrific evils to be avoided at all costs, but rather effective ways to witness to the world the power of Christ that has overcome death and removed its suffocating sting. To understand how God destroys evil, we must rely on the governing imagery that john of Patmos uses for Jesus—and that is the image of Jesus as the Lamb. . . . . when John looks up, he sees not a ferocious predator but a Lamb standing as if it had been slaughtered (5:6). This verse more than any other is the hermeneutical key to understanding violence in Revelation: admidst the chaos and war and destruction of our world, God has chosen to intervene in the form of a vulnerable Lamb. (Kraybill, 196-97). As stated earlier, our witness is our best argument for ht existence of God. We must live in such away that if Christ were not resurrected from the dead then our manner of life would be unintelligible. We can see then how refusing to return violence for violence is, ultimately, evangelical. It is missional. It is, in the lives of those who do it, a reflection of Christ’s lordship. It is a per formative moment in truth. (York, 224). This is a simple, straightforward, and helpful book. Its accessibility does not diminish its profundity. Many of its authors are well-respected ministers and theologians (sometimes both!) and regardless of reputation, all of them express a deep thought and deeper commitment to Christ—deep enough to struggle with themselves in front of the reader about the difficulties but necessities of Christian nonviolence. If this book is not convincing to some, that’s okay. But maybe it makes violence of all kinds a little less easy to tolerate or engage in. That’s okay too. If anything I think this book does a great job at complicating violence and showing that it is not the obvious answer that many of us raised in American culture assume it to be. My hope is that everyone who reads this book will take seriously its arguments and challenges even if they remain unconvinced. Thank you. This was very well written and stimulating. Pacifism is certainly a very Christian preoccupation because it goes against natural human instincts, animals instincts, to retaliate and pre-emptively act to our own advantage. When I think of the problem of violence now though two passages in the Bible come to mind. First, in James where he urges us to “Go to widows and orphans in their distress” This seems like it could justify interventional violence perhaps. Or maybe there is a more faith based approached. In either case I suspect that Christianity requires that its practitioners protect the innocent, in as much as they can, from persecution. This of course is a challenging ideal to actually live. Secondly, the story where Roman soldiers ask Jesus what they should do and Jesus says “Don’t extort people and don’t give false accusations” (Luke 3:14) rather than something like “lay down your arms”. I suspect that maybe the important thing, besides specific pacifist or violent alternatives in any given situation, is to try to act with courage and faith in a sincere devotion to generosity and mercy. Yeah, I think your last sentiment is really good wisdom. What I love about the pacifist perspective is that it puts into sharp contrast all the particularly bad and uncritical narratives that support violent activity. If you pick the book up I’d recommend reading D. Stephen Long’s chapter first. I thought he really knocked it out of the park. at the end of the day pacifism is not a position we take up so much as a struggle with other tensions in life and the Gospel, but a struggle in the right direction nevertheless. I thought Long’s article did the best job at articulating these tensions and the vulnerability of pacifism the best. And that’s the main thing isn’t it? To remain sincere in the struggle to come to real understanding. Thanks for the recommendation. I will try to remember the name D. Stephen Long if I come across any of his work.